Ingredients: soft cheese (150 grs. ), milk (1 ¼ cup), condensed milk (1 can), eggs (4), sugar (3/4 cup). Instructions: Blend all the ingredients except the sugar. In a pan put the sugar and bring to the heat until the sugar caramelizes. Pour the hot caramel in a round tin then pour the mixture into the tin. 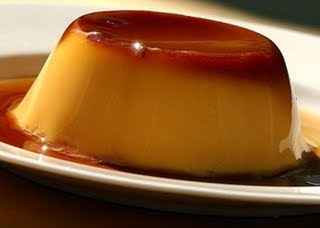 Bake the flan in bain-marie for 11 min in a pressure cooker, or 60 min in conventional oven.